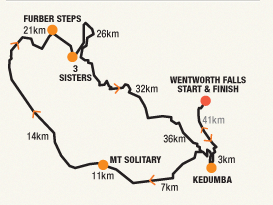 Mt Solitary Ultra: Race 3 Long Course Series (45km) 2017 | JustRunLah! This course is spectacular, quite often regarded as the must do multi day hike in the Blue Mountains, however we think it’s better to do it in a day!!! It has all the facets of what trail running is about – fast downhill fire/single trail, gnarly uphill, stairs, rolling single trail, creek/river crossings, rock clambering and diverse flora. From Mt Solitary itself the vista includes areas of Lake Burrogarang, through to the Southern Highlands, Kanagra Boyd and The ‘Wild Dog Mountains’. The course also encompasses historical and culturally significant area’s of the Gundungurra Nation. Best of all, you will be tested to the hilt . If you are aiming for The North Face or recovering from Six Foot, this race should suit you. We hope to see a few of you out there.